Home Cricket Games 2017 EA Sports Cricket07 EA Sports Cricket 2007 JukeBox Maker – Add your own music! Well, ever wanted to add your OWN music you wished in EA Sports Cricket 2007? Hindi, Urdu, Bengali, English, Spanish or whatever..? Now no worries, because we have the EA Sports Cricket 2007 Jukebox Maker! Yes! 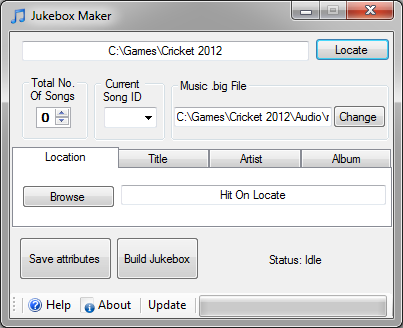 You can add your custom music on Cricket07 Now! Pretty cool, right? It’s just easy to use! Here’s some tips and tricks and steps and guides for you all, as you all are here to solve out your mistakes! It will ask you to locate the Cricket 07 Root directory. After selecting the correct root directory. It will delete the xml file. By default, the tool will select the music.big file in the audio directory. You may change if you want by pressing on change. Step 2 : Setting Things Up. Copy the music.big included and overwrite the file to which you want to import. Set total no. of songs you wish to have. -Give the Location of the File In The Location Tab, by pressing on Locate. -Set The Title, in The Title Tab. -Set The Artist, in The Artist Tab. -Set The Album, in The Album Tab. -Press the “Save Attributes” button. The tool will automatically convert the files to asf file format and then into a ditty. Then import those files in the big file. And Finally write the xml file. Any queries to be posted via comments. Next article How To Install Patches In EA Sports Cricket 2007? i am getting jukebox maker.exe application error, can you please tell me the format for this type of application?